Containers offer four seasons of pleasure, fun and creativity. Make use of this opportunity to be creative and plan on changing out the plants in your containers frequently during the growing season. Check out Blueprints for Building Containers for additional ideas and photos. Gorgeous containers bursting with colorful arrangements are a focal point and should always look their best. The amount of time and money you want to spend on your containers will determine how many times each year you want to change the plantings or add additional plants. 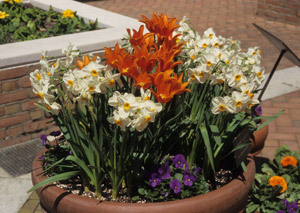 It may mean completely changing some pots with each season or just changing a few plants in each pot. Or it may mean simply rearranging your containers so that the best looking ones are always front and center, while those containers that are not at their peak are in the background. A feeling of seasonality can be expressed by changing color schemes or textures. Spring planting schemes can include bulbs, pansies, violas, dianthus, primulas, lobelias, snapdragons and fillers such as ivies and other foliage plants. 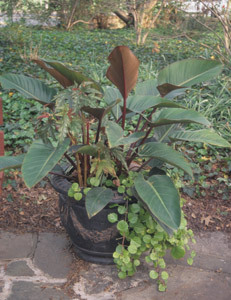 In summer, large containers can be planted with tropical plants using bulbs such as caladiums, bananas, and cannas for a tropical feel. Large containers can also be planted with miniature sunflowers, ornamental millets, zinnias and celosia to create a Midwestern feel in a sunny location. 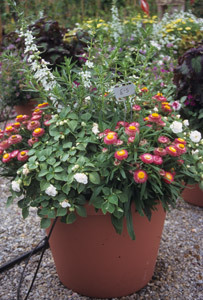 Summer flowering plants for smaller containers include Dahlberg daises, zinnias and dahlias. Fall color schemes revolve around oranges, deep golds and rich reds. Mums are the classic standby, but calendulas, pansies, ornamental kales, diascias, snapdragons and edibles such as beets and Swiss chard make great fall containers. In winter, containers can be filled with boughs of evergreens. Some foliage plants, such as springerii, can be left to dry in the containers making a decorative display all winter. Hardy trailing plants including vinca and ivy can remain in the container all winter. Woody plants offer interesting textures in winter and broadleaf evergreens such as holly, daphnes, boxwood, ivy topiaries and small conifers offer interest all winter. Arrangements of red twig dogwood and evergreen branches make a delightful seasonal display in urns near entrances. Foliage plants and woody plants will work best for containers and planters used as screens and space dividers.